Reviews | Regal Cinnamon Sticks - 3 lb. Perfect for your specialty drink menu, Regal cinnamon sticks add fragrance and flavor to your drinks, desserts, and more! One of the oldest known spices, cinnamon is derived from the dried inner bark of a tropical cassia tree. Reddish brown in color, cinnamon sticks have a woody, earthy flavor that is warming to taste. They make an appealing garnish to a variety of foods and hot drinks. Replace a traditional stirring stick with a cinnamon stick and add flair to hot chocolate, cider, and other hot beverages! I have been super happy with these Regal cinnamon sticks. We use them as stir sticks in hot chocolate. I prefer the cinnamon flavor from the sticks compared to regular cinnamon powder. Great cinnamon sticks. We use these in our hot cider and also for seeping in our hard cider. They really seem to burst with cinnamon flavor. Perfect for grating at home or crushing to use in mulled wine/cider, Regal continues to never fail! Great product, great prices. Try as a stirrer for tea or apple cider as well to beat this cold winter! Great price for a quality product!! You can't find it any cheaper, even at big box discount stores. Just plan your usage to maximize your order for the shipping charge. Best price for cinnamon sticks that I've seen anywhere. Good quality but way cheaper than any stores. If you use cinnamon sticks, this is where you should get them. Really great value! We used this to garnish our hot apple ciders with and our customers loves the added touch. We can't find this quantity for this price anywhere! Wow! What a great value! The container was jammed full of cinnamon sticks. Another great purchase of a quality product from Webstaurant Store! Wooo hooo! I always buy Regal branded Cinnamon Sticks because the flavor seems to linger more in hot drinks than they do in other brands. My customers love these in my spiced teas and apple hot cider. These are also great for cookies and cakes. Cinnamon sticks can be pricey and these are the best value i can find anywhere. We use them on top of pastries and they look very nice. You can break them easily by hand too to make smaller pieces. I love these for fall baking and boiling in fresh apple cider! Great option.. hard to find large containers of cinnamon sticks. I enjoy all of the regal products offered here. These cinnamon sticks are the perfect garnish for our spiced rum and warm cider drink we serve in the cool months of fall and winter . These are the perfect thing for topping off any drink with and for cooking with as well! This is such and a awesome price for such a huge amount of cinnamon sticks as well! Nice cinnamon sticks at a great price point. Sticks are thick, flavorful and very aromatic. We will continue to buy this product as more is needed. I always buy my cinnamon sticks from regal now, after trying many different types its the best out there. They always smell great and are long lasting. Love the smell of cinnamon sticks and they are great for using in our fall potpourri blend. The sticks are well packaged and arrive with a strong smell. Love Regal's quality. First I tried the 4oz box of this product and I like it and I bought the bigger amount for my shop. They are good ones for my teas. A nice container of whole spices that are well priced and very good quality. The cinnamon stick are perfect for garnishing apple cider and really add extra flavor. I purchased the Regal Cinnamon Sticks in the 3 lb. container this year for my children to make homemade potpourri for friends and family gifts. They smelled so aromatic and gave the house a cozy and comfy feel as well. The price for this product was exceptional compared to what I have paid in the past for smaller containers. We will definitely make this purchase again! These Regal cinnamon sticks are have the best smell! I love having them in the fall and winter and adding them to cider or teas. A great buy for the bulk jug of cinnamon sticks. The sticks are a great quality and super aromatic. Great for making our homemade mulling spices. These are great and I love that they come in a hard container versus the usual bag I get when I order in bulk. Way easier to keep them from breaking. Such a great buy on cinnamon sticks! I usually pay about half this price for a small jar of these. Love having these aromatic spices on hand for the holidays; brings a great punch of flavor to cider, horchata, or even hot chocolate! These cinnamon sticks are so fresh and aromatic when you get them..they work perfectly whole or roughly broken in a brine or grated into recipes..great price as well. This bulk container of cinnamon sticks is amazing. I love using cinnamon sticks for apple cider and mulling spices. I can only find the small jars in the stores and they are so expensive. This was a great find. Regal foods 3# cinnamon sticks! Wow. That's a lot of cinnamon sticks. They are all uniform in size. Approx 2.5-3" in length. Perfect for the holidays and crafts. At under $15 you can't beat the price! I love using cinnamon sticks in my apple cider. I make it at Christmas time and infuse the cider with cinnamon sticks, orange peel, and clove. Yum! Always using cinnamon sticks in some of our cocktails and desserts. Best price and value I have found. We will continue to use this product for a long time to come. These have a good flavor to them. Some cinnamon sticks taste stale, these do not. These are good for grating to have freshly grated cinnamon or as a tasty and edible garnish for teas and more. This is A LOT of cinnamon sticks. I only needed about 50, and this container has about 4 times that much. It is good quality and will make a great accent to the wassil I am making. Cinnamon is my favorite fragrance and spice. I love the aroma and flavor added to food, hot drinks and potpourri and use it all year. It's not just for the holidays for me. This is an excellent purchase. I used these for favors at ta baby shower and I had tons left over. They make the house smell so great that I place them in a container on the table during the Holiday season. We make our own glazed carrots using the sellers checked boil the carrots in the water adds an amazing flavor with sugar they are to die for . Regal Cinnamon sticks are fantastic. Great product with great flavor. You get 3lbs and the price is right. We will be buying this item again. Love these bulk cinnamon sticks. We use it for everything during the holidays from Gingerbread House making to cookies, and they make awesome stirrers for our Hot Cocoa and Teas! 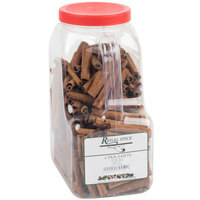 this cinnamon sticks comes in a large container and keeps it fresh, i like the price and the cinnamon is just the good length for the size of pots i have. i made some apple with cinnamon siicks tea. Smells great and cheap to make expensive drinks. Enjoy! Good deal and a a reusable carry container. I use cinnamon sticks a lot in many of my preparations. Will definitely buy more of these. Good product !